Shockingly, I didn't have a "helper" for this one. My daughter was making her own playdoh biscotti, instead. My son sat inside a cupboard and opened and closed the door. Sure, it was the cupboard with the garbage can and he may have been digging through it a bit. A lot. Ok, he ate some leftover lunch he found sitting on top. But hey, a rare moment of peace while baking :) And yes, I did remove him from the garbage. Cream butter and sugar until fluffy. Add eggs one at a time, and beat after each addition until nicely combined. Beat in extracts. Combine the baking powder and salt with the flour and gradually stir into butter mixture. Lastly, stir in the almonds. The dough will be fairly sticky. Shape into two rectangular "logs", measuring about 3 inches by 12 inches. (Use lightly greased parchment paper). Sprinkle with the 2 tbsp of sugar. 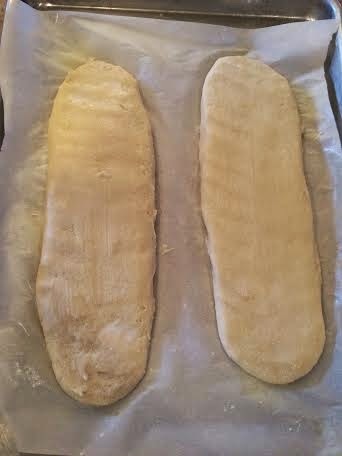 Bake in a preheated 375 degree for about 20 minutes, until slightly firm to the touch. Remove from the oven and let cool on the parchment paper on a wire rack for about 15 minutes. Don't let cool completely, or else they will be very crumbly to cut. 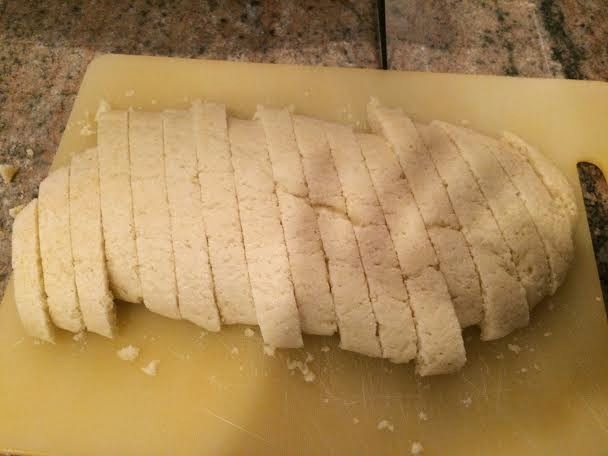 Cut into 1/2 to 3/4 inch slices, at a slight angle. Place the slices cut side down on a baking sheet, and cook in a 300 degree oven for about 8 - 10 minutes more. Flip, and then bake for another 8 to 10 minutes. Allow to cool on the pan, where they will firm up even more. Melt chocolate over simmering water, or in the microwave at short time intervals. 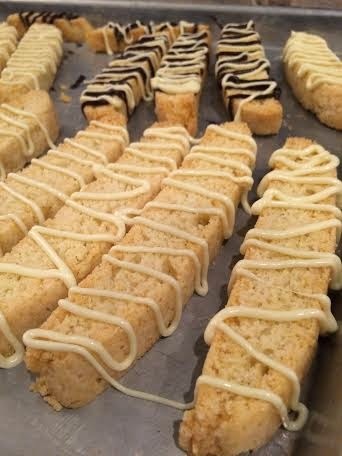 Drizzle with a spoon onto the biscotti, or pipe onto cookies using a piping bag or ziploc bag with a hole cut in the corner. Allow chocolate to firm up and enjoy! 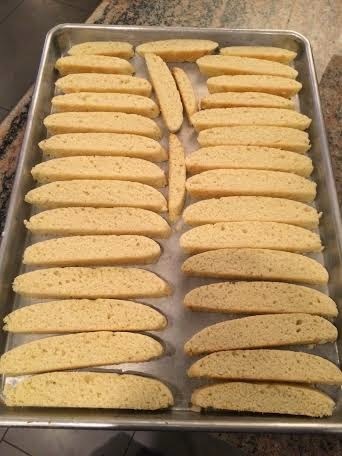 Biscotti is a favorite in our house. Almond is such a classic flavor. Love the drizzle! French Bread - and toast!